White House counsel Don McGahn has been cooperating "extensively" with the special counsel's probe into whether President Trump has obstructed justice, The New York Times reports. 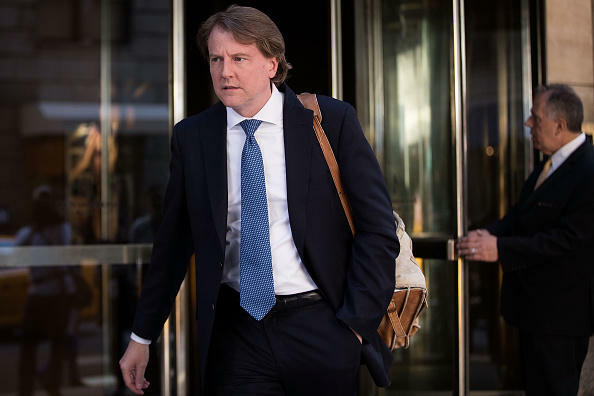 Over the last nine months, McGahn was involved in three interviews with investigators -- at least -- totaling 30 hours, according to The Times, which cites a dozen former and current White House officials as well as other people who were briefed. All of those interviews were voluntary. When Mr. Trump's first personal legal team announced a strategy to cooperate fully with the special counsel's investigation into Russian election meddling, McGahn became concerned that the president was setting up McGahn to take the fall for any possible illegal acts of obstruction. He and his lawyer, William Burck, began collaborating with Mueller's investigation to show that he had nothing to hide, The Times reported. McGahn was able to provide investigators with insight into Mr. Trump's thinking at pivotal points during his presidency, such as the firing of former National Security Adviser Michael Flynn and former FBI director James Comey, and his attempts to assert control over the investigation, The Times reported. McGahn and Mr. Trump have had a strained relationship for months, and rarely meet alone. Mr. Trump's personal lawyer, Rudy Giuliani, called on Mueller to end the investigation in a tweet shortly after the report was published. Time for Mueller investigation to file report. We will release ours. Don’t interfere with election like Comey.The President had nothing to do with Russians. He didn’t obstruct an investigation. 1.4 million documents and 32 witnesses no privilege raised.